Grayslake, IL - In the history of the monastery there have never been more priests inside its Altar than today. Three bishops led the praise of our God - one Bishop born in America, one born in Serbia and one born and raised in Africa. The church was packed and the fellowship hall was full. Many people commented how the feeling of Pentecost (coming down of the Holy Spirit) was obvious. Two ordinations and one elevation during the liturgy truly added to the experience of this divine service. The combination of the Monastery choir and the seminary students chanting was delightful. The Serbian hospitality and the delicious food following the liturgy was usual, but we all know what usual means. 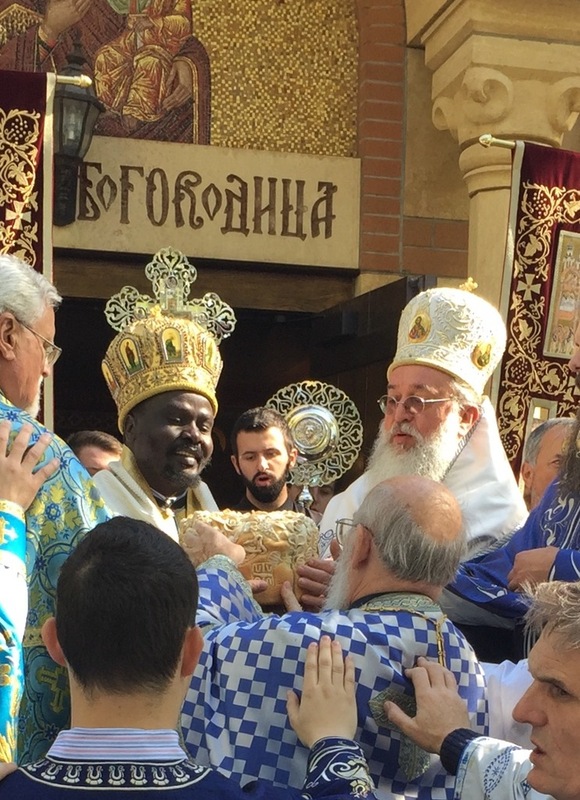 The Bishop of the Midwest Diocese was full of joy and especially because he had an opportunity to send help to our brothers and sisters in Kenya, Africa, through their bishop whom he also personally gifted with a panagia. The Abbot of the Monastery greeted everyone in the fellowship hall and expressed his joy and gratitude, and remembering those who have passed on and still around who made sacrifices in order to build this holy habitation but also encouraged people to come and partake of its hospitality, spirituality and blessings. The Monastery is open and welcomes everyone. Happy and blessed feast day.